Tibble Fork is beautiful in the early fall but man is it crowded. I took a million pictures of our beautiful girls stationed from my little blanket in the sun. (My sunburned forehead is proof). I decided that I would do a collage of some of the pictures. If you click on them, you can see the collage bigger. Here is silly Ivy. I love the bottom middle picture. Okay, it's kind of mean of me to like it so much. She was out by the lake and a bug flew on her. This is her freaking out, while I sat snapping pictures from the blanket. Scott did save her and she smiled as soon as it was gone. Now for pictures of serious Jade. 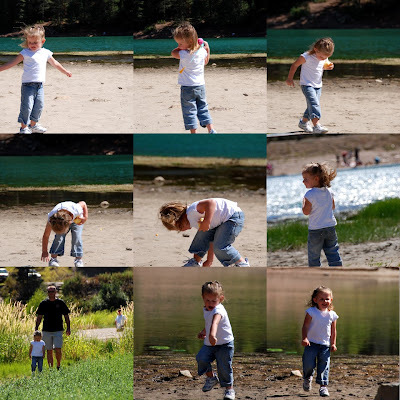 She tried to learn how to skip rocks, but as you can see from the middle picture and the rock high above her head, her form is all wrong. Can you believe her playing with the gross worms? Honestly, sometimes I'm shocked she came from me. I have found that being stuck in one place, I get a lot more of Jade's backside than I do her face. Here are a few pictures I took of the day. 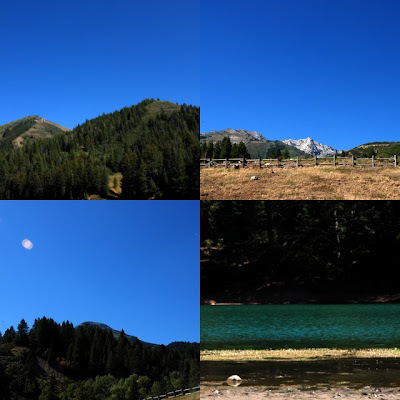 The sky was such a beautiful blue and the lake was a shocking green. 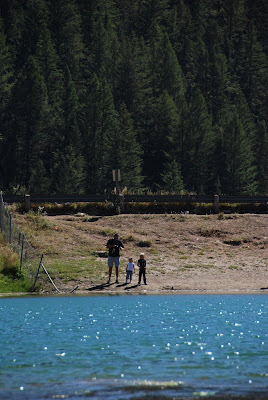 Lastly, a picture of my family fishing on the other side of the lake. 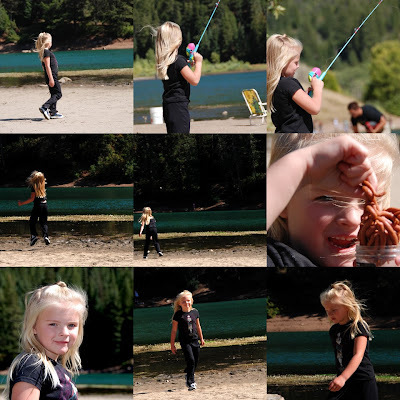 I found out after I took these pictures that our video camera has a better zoom. Oh well. That is one cute little family! Love the collages! You are so fancy! How are you feeling?